Geothermal energy is a “green” way to cool and heat your home or business. More importantly, geothermal energy is also comfortable, reliable, and cost effective. We can help you determine if geothermal energy is right for you and, if so, can guide you through the engineering process. Geothermal energy systems rely the earth’s natural ability to emit and/or absorb heat. They work by circulating water from a heat pump inside the building through piping to the bottom of a nearby well or system of wells. In the winter the water in the piping system will be warmed by the earth. The heat pump will pull the heat from the circulating water and distribute it to your home through the HVAC system. 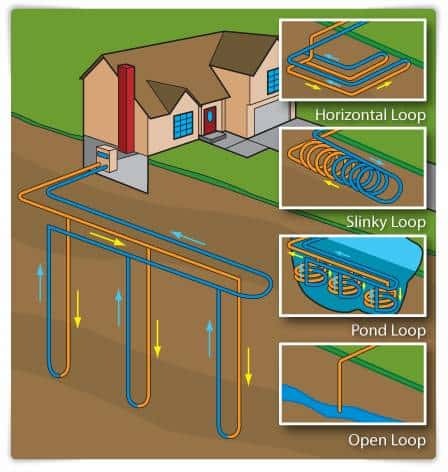 In the summer the heat pump will transfer the heat from your home into the water which will then dissipate into the earth surrounding the well. We specialize in the well drilling and installation of associated exterior piping for geothermal systems, but can also provide a single source HVAC geothermal installation utilizing local, qualified HVAC contractors to complete your project or work directly with the HVAC contractor of your choice. We have completed projects ranging in size from single-family residential to commercial applications with wells numbering in the hundreds. Homeowners may be eligible for a 30% tax credit for installation of qualified geothermal heat pump systems. This includes the cost of the well installation. Please see the links below for more information or contact your accountant.